This ESB 41-Back Hoth Stormtrooper is referred to as a Quality Assurance/Quality Control (QA/QC) sample. Carded figures of this nature are utilized for approval to determine if the final product meets specific criteria in terms of packaging quality, etc. 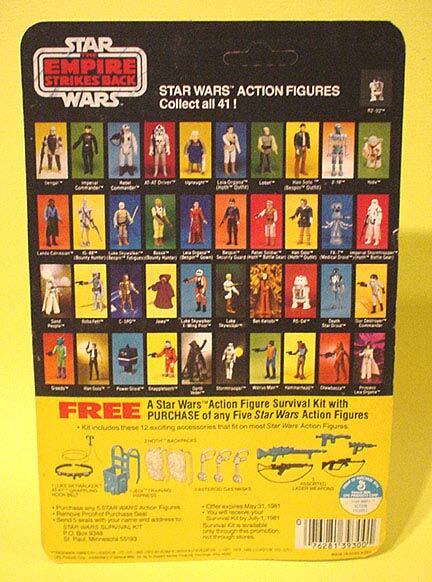 The card front contains the date of inspection and the intials of the Kenner quality control engineer who reviewed this piece. Above we see a picture of the cardback which is designated as an ESB41A. No sign-off information is present on the back of the card. QA/QC labels are sometimes affixed to the front or rear of the card. 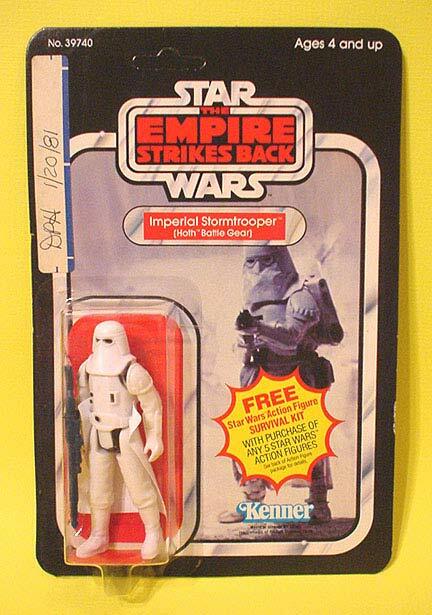 Signatures and/or information may be written on items ranging from specifically formatted labels, formatted index cards, simple nondescript labels like the one found on this one, or directly on the card, like the ESB 31-back Hoth Stormtrooper carded QC sample seen here.